Mozilla's Firefox web browser comes with built-in screenshot capturing functionality; first launched as a Test Pilot experiment to gather data and interest in the feature, screen capturing is now part of Firefox natively. Just click on the three dots in the Firefox address bar and select the "take a screenshot" item from the menu to start the process. You can capture the entire page or part of it, and save the screenshot online or locally. I spotted Easy Screenshot on Mozilla's Firefox Add-ons website; it has the fourth largest installation base of all Firefox extensions. Easy Screenshot is created by Mozilla Online, a whole subsidiary of Mozilla Corporation that operates in China. The subsidiary distributes custom Firefox browsers in China and releases some of the extensions that it creates on Mozilla AMO. Easy Screenshot is a screen capturing extension for Firefox that users of the web browser may install. It adds screenshot capturing and editing to the browser; one of the core differences to Firefox's native screenshot implementation is that Easy Screenshot does not support online uploads or sharing of screenshots online as it saves screenshots to the local system only. 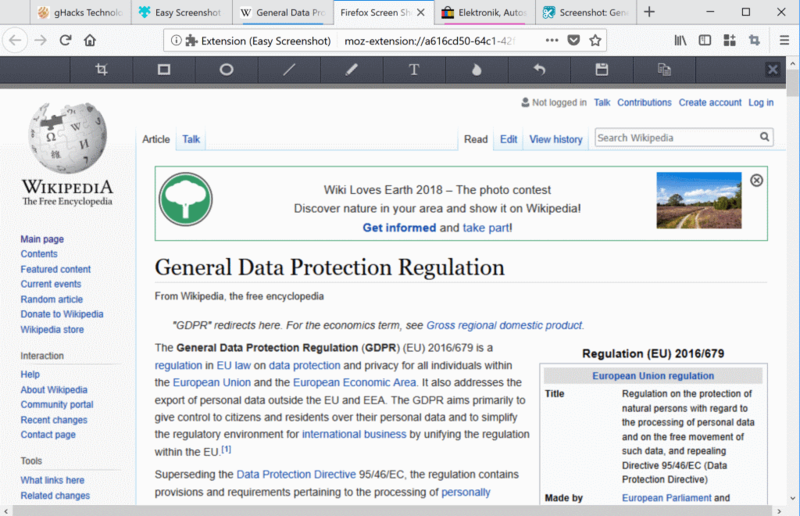 The extension has not been updated since 2017 and it is likely that it won't receive any more updates thanks to the native integration of screen capturing in Firefox; still, it does not appear to be based on Firefox Screenshots. Note: Easy Screenshot is not the first extension to add screen capturing functionality to Firefox. We reviewed NativeShot back in 2016 which supported similar functionality. NativeShot is not compatible with Firefox 57 or newer, though. Easy Screenshot is very simple to use: click on the extension icon displayed on Firefox's main toolbar and select the type of screenshot that you want to capture. The extension supports capturing the entire web page, the visible part of the web page, or a region on the web page. You draw a rectangle on the screen if you select region from the list of options, the other two screen capturing methods work automatically. All three load the built-in image editor after the capturing. The editor supports a couple of basic options: draw shapes such as rectangles or lines on the screen, use freehand drawing, add text, or blue content. You can copy the screenshot to the clipboard after the editing or click on the save icon to save it to the local system. Firefox's native screen capturing tool comes with an editor as well but it does not support some of the options right now; it does not support blur or the drawing of shapes on the screen. Easy Screenshot is a super simple yet powerful screen capturing extension for Firefox. It is compatible with Firefox 57 and newer versions of the web browser. The core differentiating factors between Easy Screenshot and Firefox's native screen capturing functionality are the former's focus on saving screenshots locally only and better image editing tools. Now You: How do you you capture screenshots in your browser of choice? What's the fastest way to take a screenshot on Windows 10 natively? I use ‘Page Saver WE’ to handle screenshots on Firefox; it handles only ‘visible portion’ and ‘entire page’ so if I need a delimited area of the screen I’ll have to edit the image myself. As much as I appreciate Firefox as much I am cautious with its built-in features, in analogy with Microsoft OSs when external tools do a better job than native applications and are less likely to be privacy invasive. I use the addon “Fireshot” which allows you to save / copy as an image or create a PDF directly. It supports capturing the entire web page, the visible part of the web page, or a region on the web page too. This is more than enough for my needs. Pearl Crescent Page Saver 2.8.7 with Pale Moon. I were using Screengrab before but I do not trust all add-ons anymore made by the developer due to the crap he decided to implement, spying your habits. So true. All this developer extensions I’ve tested connect to s3blog.org for one reason or another. Greenshot rocks; it’s always sitting up there in the systray. However, the ability to precisely capture a specific element in FF with Take a Screenshot is handy. Thanks for your suggestion, ShareX will remplace the old PrintKey 5.10. I have the lifetime subscription of FastStone Capture. It has many options. Maybe a little learning curve to use all of them, but I believe that it has all of the features that a screen capture tool could have. Anyway when I have to give up Firefox ESR for the Firefox Quantum version, I will try it. I use the built in windows snipping tool. Why reproduce a built in system function? The fact that the chinese coded it is enough reason for me to not even poke it with my 10′ stick. I got angry because I accidently clouded a screenshot when using the built-in tool. This is a gross privacy invasion which more cynical people may deem a deliberate ruse (the buttons are close together). Anyway, I found if you go to about:config and paste “extensions.screenshots.upload-disabled” and set it to “true” then the issue is resolved. I hope that helps someone.